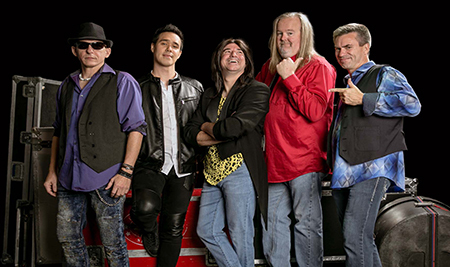 The gold standard by which all Journey tributes are measured, Resurrection- A Journey Tribute faithfully recreates the experience of a 1980’s Journey concert. This dynamic and compelling group features some of America’s top musicians, many of whom have performed, written, or recorded with the biggest names in the music industry – including Journey and Steve Perry. Every show features one brilliant hit single after another, offering the perfect fusion of songs to captivate and transport audiences to the glorious age of arena rock. The show is an impeccable coordination of sensory components including lighting, sound, video, staging and costumes. Relive those glory days of rock with hits like “Separate Ways,” “Any Way You Want It,” “Lovin’, Touchin’, Squeezin’,” “Don’t Stop Believin’” and more. A combination of incredible musicianship, the vocal precision (and appearance) of the legendary Steve Perry, and stage presence has garnered the band nationwide acclaim.